In simple terms, SBLC is bank guarantee in LC format. to make payment on account of any default (including any statement of default) by the account party in the performance of an obligation*. As defined above, the term standby letter of credit would not include commercial letters of credit and similar instruments where the issuing bank expects the beneficiary to draw upon the issuer, which do not “guaranty” payment of a money obligation of the account party and which do not provide that payment is occasioned by default on the part of the account party. The development of SBLC took place in the United States where the banks do not have the power to issue performance bonds and first demand guarantee. What is Buyers Credit Against SBLC? Under the new structure, SBLC sent under MT760 will be underlying security against which overseas branches will fund the import transaction. MT799 is open format where as MT760 is a structured format. No standardized process is prescribed by RBI, thus each bank have their own process and requirement of documents before a buyers credit transaction is funded. A generalized process has been given below. Importer enters into contract with supplier for import of goods under LC/DA/DP. Suppliers ships the goods and submits document to supplier’s bank (as per agreed payment terms). Supplier’s Bank in turn submits documents for importer’s bank for payment. Importer requests the Buyer’s Credit Consultant before the due date of the bill to avail buyers credit quote. Consultant approaches overseas bank for indicative pricing, which is further quoted to Importer. If pricing is acceptable to importer, overseas bank issues offer letter and shares all required format. Some overseas branches are asking for a separate request letter from importer before offer letter is issued. Importer accepts of the offer letter and execute loan agreement (2 copies). Importer’s bank emails scanned image of offer letter, loan agreement and photo copy import documents to Overseas Bank and followed by courier. Importer’s bank issues SBLC in the given format under SWIFT message format MT760. 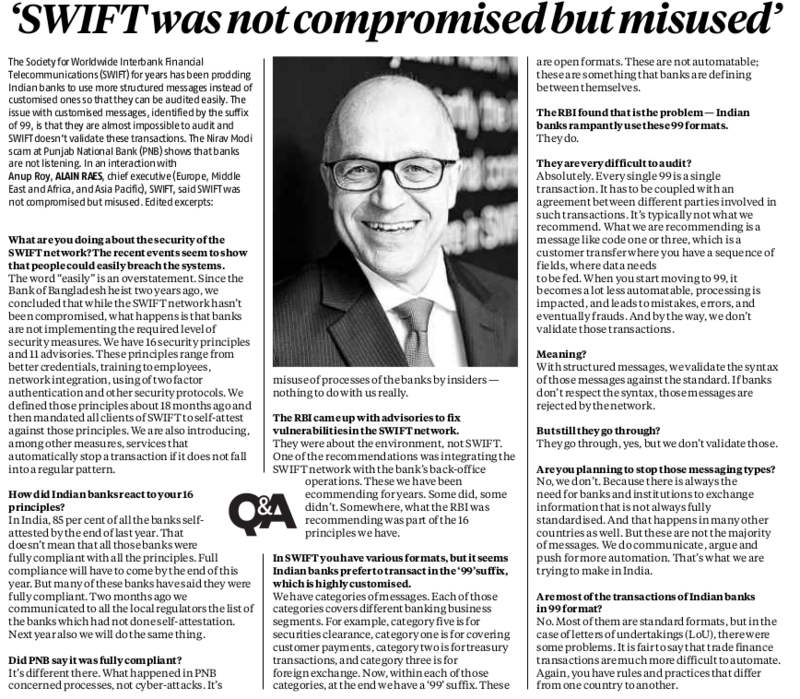 Importer’s bank issues MT799 in given format containing details more or less same as earlier LOU format. Some bank instead of MT799 asking for details on bank letter head. On receipt of 6, 7, 8, overseas branches funds the buyers credit transaction to the Nostro Account of Importer’s bank and sends repayment details by MT799. On due date Importer’s bank to recover the principal and Interest amount from the importer and remit the same to Overseas Bank on due date. Most Overseas branches are not accepting Direct Import Documents and few are also not accepting DA/DP documents under this structure. Some Overseas Bank insisting on SBLC tenure to be buyers credit tenure + 15 days additional. Interest Charges: which will be Libor + bps for period from date of financing to the maturity date. SBLC (MT760) Issuance Charges: Importer’s bank will charge for issuing SBLC. Varies from bank to bank. MT799 charges : Importer’s bank will charge. Varies from bank to bank. Forward / Hedging Cost: Forward premium as per market rate. Arrangement fee: Fees paid to trade finance consultant for his service. Other charges: A2 payment on maturity, Form 15CA and 15CB on maturity etc. Buyers Credit against SBLC structure has to be approved internally by bank before it is offered to importer. Most importer do not have SBLC limits in existing sanction. Thus existing limits have to be modified. Not all payment mode is acceptable to overseas bank. Like direct documents and for some bank even DA/DP mode is not acceptable. Some bank are issuing SBLC only to their own overseas branches and charging rates as high as 6 Month L+350 bps earlier and now with revised cap to 6 Month L+250 bps. TAT of completing the transaction is gone up. Earlier structure required only issuance of LOU/LOU, but under the new structure it requires signing of loan agreement, offer letter acceptance and courier originals to overseas bank. Additionally banks will have to send MT760 and in some banks case also MT799. Query are been raised by some local bank on few conditions in SBLC format. Thus delaying the process or limiting the number of bank from where quote can be arranged. 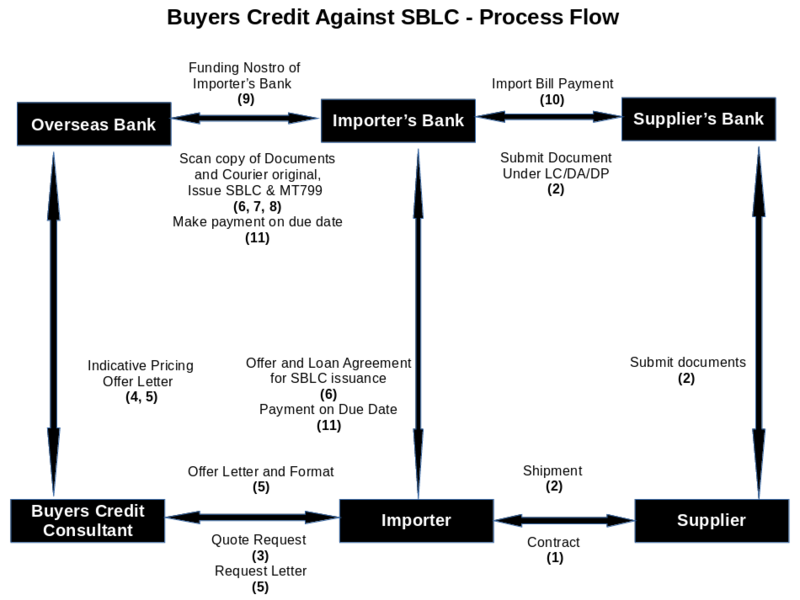 Some banks are not doing buyers credit against SBLC for import for capital goods. Loan Agreement has to be executed for every transaction. What should Importer Do ? Check if Buyers Credit against SBLC structure is approved internally by bank. Get SBLC limits sanctioned under existing limits as sub limit or get fresh limits sanction. Structure the payment terms (LC, DA, DP or Direct documents) with due consideration. Discuss with bank on the process and documentation that will be required from bank end. Above $50 Million, RBI Approval required. Maximum Maturity in case of import of non capital goods (Raw Material, Consumables, Accessories, Spares, Components, Parts etc): upto 1 year from the date of shipment or operating Cycle whichever is less.